"Mindong" redirects here. For information about the Eastern region of Fujian Province, China, see Fuzhou and Ningde. Eastern Min, or Min Dong (simplified Chinese: 闽东语; traditional Chinese: 閩東語; pinyin: Mǐndōngyǔ; Foochow Romanized: Mìng-dĕ̤ng-ngṳ̄), is a branch of the Min group of varieties of Chinese. The prestige form and most-cited representative form is the Fuzhou dialect, the speech of the capital and largest city of Fujian. Eastern Min varieties are mainly spoken in the eastern part of Fujian Province in People's Republic of China, in and near the cities of Fuzhou and Ningde. They are also widely encountered as the mother tongue on the Matsu Islands, Republic of China. Additionally, the inhabitants of Taishun and Cangnan to the north of Fujian in Zhejiang also speak Eastern Min varieties. Eastern Min generally coexists with the official standard Chinese in all these areas. As the coastal area of Fujian has been the historical homeland of a large worldwide diaspora of overseas Chinese, varieties of Eastern Min can also be found across the world, especially in their respective Chinatowns. Cities with high concentrations of such immigrants include New York City, especially Little Fuzhou, Manhattan; Sunset Park, Brooklyn; and Flushing, Queens. They are also found in various Chinatown communities in Europe, including London, Paris, and Prato in Italy. Chinese communities within Ikebukuro, Tokyo, Japan as well as Sibu, Sarawak, Malaysia have significant populations of Eastern Min speakers. Fuzhou communities can also be found in Sitiawan, Perak and Yong Peng, Johor in West Malaysia. Houguan dialect group (侯官片), also called the Southern subgroup, including the Fuzhou dialect, Fuqing dialect, Lianjiang dialect and the dialect of the Matsu Islands. Funing dialect group (福寧片), also called the Northern subgroup, including the Ningde dialect and the Fu'an dialect. Manjiang dialect (蠻講), spoken in parts of Taishun and Cangnan, Wenzhou, Zhejiang. Besides these three branches, some dialect islands in the southern Chinese province of Guangdong were classified as Eastern Min. Zhongshan Min is a group of Min varieties spoken in the Zhongshan county of Guangdong. According to Nicholas Bodman, only the Longdu dialect and Nanlang dialect belong to the Eastern Min group, while the Sanxiang dialect belongs to Southern Min. The Eastern Min group has a phonology which is particularly divergent from other varieties of Chinese. Aside from the Manjiang dialect, both Houguan and Funing groups are similar in the number of initials, with the Fu'an dialect having 17 initials, two more than the Fuzhou dialect, the additions being /w/ and /j/ or /ɰ/ as separate phonemes (the glottal stop is common to both but excluded from this count). 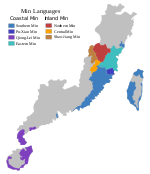 The Manjiang dialect on the other hand has been influenced by the Wu dialects of Zhejiang, and hence has significantly more initials than the varieties of Fujian. The finals vary significantly between varieties, with the extremes being represented by Manjiang dialects at a low of 39 separate finals, and the Ningde dialect representing the high at 69 finals. The Eastern Min varieties have a wide of range of sandhi phenomena. As well as tone sandhi, common to many varieties of Chinese, there is also initial assimilation and also vowel alternations (such as rime tensing). Tone sandhi across Eastern Min varieties can be regressive (where the last syllable affects the pronunciation of those before), progressive (where earlier syllables affect the later ones) or mutual (where both or all syllables change). The rules are generally quite complicated. Initial assimilation is usually progressive, and may create new phonemes that are not phonemically contrastive in initial position but do contrast in medial position. A few varieties exhibit regressive assimilation too. ^ Hammarström, Harald; Forkel, Robert; Haspelmath, Martin, eds. (2017). "Min Dong Chinese". Glottolog 3.0. Jena, Germany: Max Planck Institute for the Science of Human History. ^ 李如龙 Li Rulong (1994). 福州方言词典 Fuzhou Fangyan Cidian (Rev. 1st ed.). Fuzhou: 福建人民出版社 Fujian Renmin Chubanshe. p. 1. ISBN 7211023546. ^ Guest, Kenneth J. (2003). God in Chinatown: Religion and Survival in New York's Evolving Immigrant Community ([Online-Ausg.]. ed.). New York: New York University Press. p. 48. ISBN 0814731546. ^ Pieke, Frank. "Research Briefing 4: Transnational Communities" (PDF). Transnational Communities Programme, Institute of Social and Cultural Anthropology, Oxford. Retrieved 2 March 2015. ^ Kurpaska, Maria (2010). Chinese language(s) : a look through the prism of the great dictionary of modern Chinese dialects ([Online-Ausg.]. ed.). Berlin: De Gruyter Mouton. p. 71. ISBN 9783110219142. ^ Bodman, Nicholas C. (1984). "The Namlong Dialect, a Northern Min Outlier in Zhongshan Xian and the Influence of Cantonese on its Lexicon and Phonology". Tsing Hua Journal of Chinese Studies. 14 (1): 1–19. ^ Bodman, Nicholas C. (1985). "The Reflexes of Initial Nasals in Proto-Southern Min-Hingua". In Acson, Veneeta; Leed, Richard L. For Gordon H. Fairbanks. Oceanic Linguistics Special Publications. 20. University of Hawaii Press. pp. 2–20. ISBN 978-0-8248-0992-8. JSTOR 20006706. ^ 李, 含茹. "苍南蛮话语音研究--《复旦大学》2009年硕士论文". cdmd.cnki.com.cn. Wikivoyage has a travel guide for Mindong phrasebook. Norman, Jerry (1977–1978). "A preliminary report on the dialects of Mintung". Monumenta Serica. 33: 326–348. JSTOR 40726246. Yan, Margaret Mian (2006). Introduction to Chinese Dialectology. LINCOM Europa. ISBN 978-3-89586-629-6.